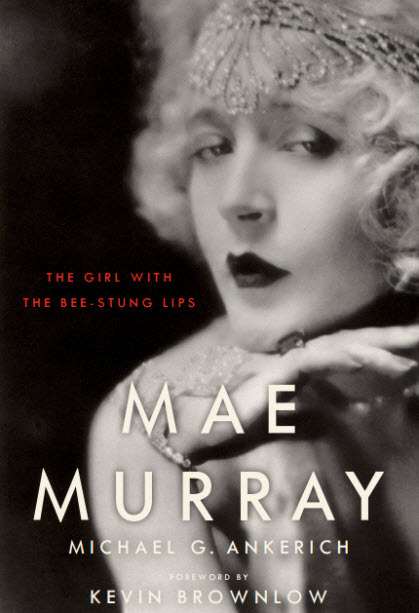 One of the best parts about Mae Murray: The Girl with the Bee-Stung Lips are the photographs that are intermingled throughout the book’s 392 pages. My publisher, The University of Kentucky Press, was very generous with their allotment. I started out with about 150 that I felt should be part of the final product. We negotiated and settled on just under 100. Just under a hundred images of Mae at her best (portraits, candids, production stills) and of her family and friends. In this post I share some of the photos that didn’t make the book. I think they are fascinating and interesting to anyone reading the her biography. 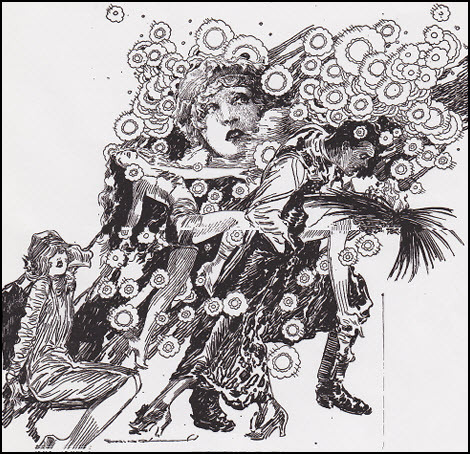 Special thanks goes to Eric T. Rebetti, a loyal Mae Murray collector, for his generosity in providing some of the images in this blog and for the book. I originally had this one in mind for the cover. It’s one of my favorites. One of the earliest images I had of Mae. From a 1908 news clipping. 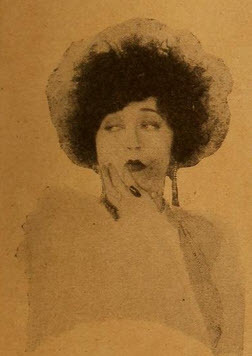 Mae in The Dream Girl, her third film. 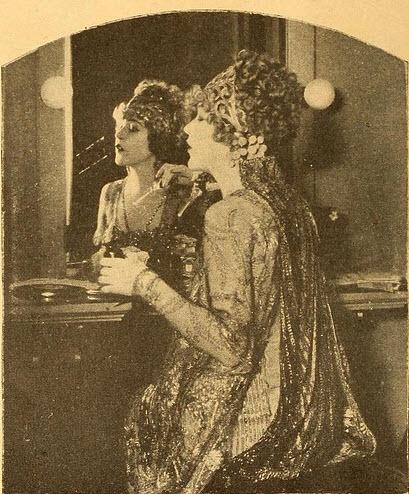 Mae Murray in one of her best roles: Mary McGuire in The Delicious Little Devil. 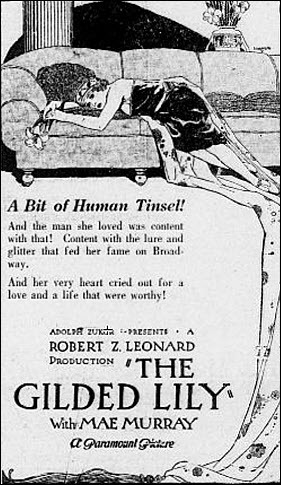 In a scene from The Right to Love (1920). Mae and Vincent Coleman clowning around on the set of Fascination. The two actors switched roles one afternoon. The story is in the book. Mae strikes a pose at the studio with one of her automobiles. From a color screen test. The screen test can be found here. Edsel Ford, president of Ford Motor Company, and wife Eleanor visit Mae on the set of Jazzmania (1923). Mae posing at the Broadway entrance to Grauman’s Metropolitan Theatre in Los Angeles. 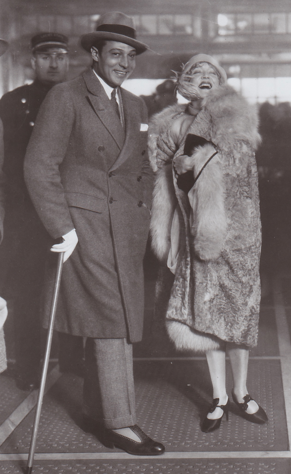 The day in July 1926 that Mae (L) injected herself into the crown prince and princess of Sweden’s visit to MGM. Mae and Louis B. Mayer are shown on either side of the royals. 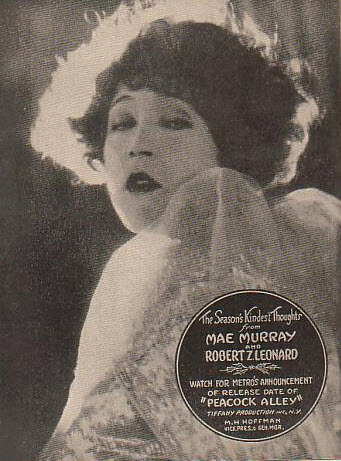 The episode is told in detail in Mae Murray: The Girl with the Bee-Stung Lips. Mae fights for custody of her son (1940). Mae is carried from her apartment after suffering a stroke in 1960. Hollywood thought it had lost its Girl withthe Bee-Stung Lips. One of the final chapters in Mae’s life came in 1964 when she got off a bus in St. Louis. She thought she had arrived in New York City. She is pictured in St. Louis with a representative from the Salvation Army. Mae lands in Los Angeles after her sad adventure in St. Louis (1964). Mae with paramour Guido Orlando in 1939. Lottie, my film buff friend who lives in Atlanta, interviewed me several years ago about Dangerous Curves atop Hollywood Heels. 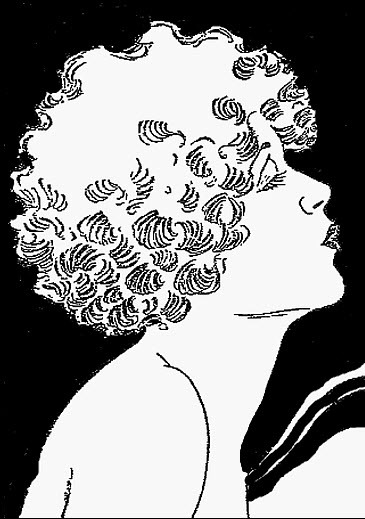 Last week, while I was working on the index for Mae Murray: The Girl with the Bee-Stung Lips, Lottie asked me whether she could read the proofs. I let her have a look. After reading through the text, she asked if she could have the first interview I gave about the book. I said, “Okay.” Here is some of our conversation. 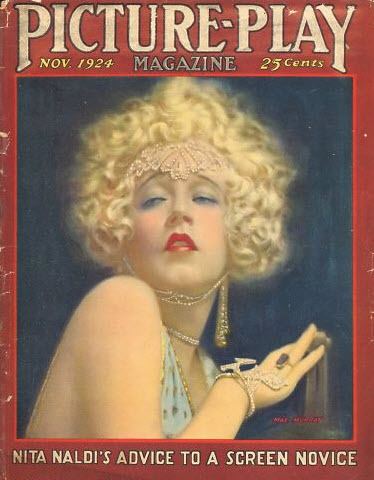 Lottie: Why Mae Murray and what intrigued you about her? Michael: Why not Mae Murray? I couldn’t think of a better subject to explore and spend a couple of years with. I think what intrigued me most was the span of her career. She worked in every phase of entertainment. 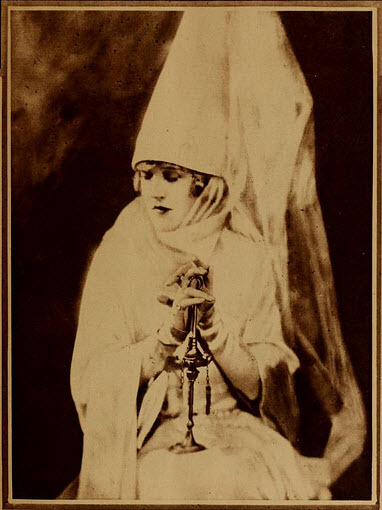 She was on the stage as early as 1904; she was in the Follies of 1908 and 1909; she was there for the birth of cabarets and exhibition dancing; she worked again for Ziegfeld in the Ziegfeld Follies of 1915; she began huge star in silent films; she worked in vaudeville; she did radio and television. What an amazing career this woman had, yet so much is unknown about her today. There are many misconceptions about her career and her private life. Michael: That’s the way Mae wanted it. She was very clever about concealing the truth: the truth about such incidentals as her beginnings, immediate family, the details around the birth of her son. 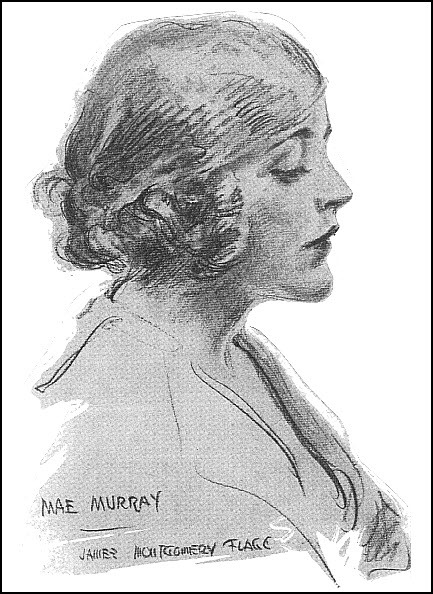 Early in my research, I came across a quote from a writer who had interviewed Mae in 1920. The writer, Delight Evans, began her story this way: “To begin with, everything, or nearly everything that has been written about her, is wrong.” She was right. On the set of Fashion Row. Lottie: So, she was a challenge from the start? Michael: From the very start. When I set out to write this biography several years ago, I became a little queasy when fellow writers would say things like, “How you write a biography when no one knows when and where she was born?” Or, how can you complete her life story without talking with her son, who has refused to talk with the media about his mother?” Those were valid questions that only made me more persistent in uncovering the facts. Lottie: In the end, you were able, as I understand it, to locate those important documents in her life. Michael: Yeah, I had the marriage certificate of her parents before I found Mae’s own birth certificate. In time, I was able to examine the marriage certificates for all four of her marriages and death certificates of her immediate family. These documents were critical in piecing together Mae’s path through history. Lottie: From what I’ve read about Mae, she could have been born in Portsmouth, Virginia, New York, or Europe. Michael: Yes, she said once she was even born on her father’s yacht as they sailed around the world. She said often that she was in a convent in Chicago. 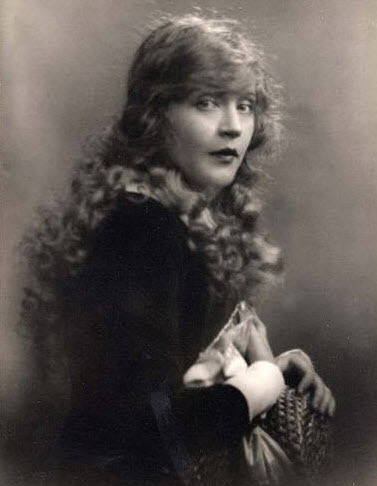 A very young Mae Murray. Lottie: Right, so how did you pinpoint where to look for her? Michael: I dug down into the weeds and found a person I thought might be her nephew, Mae’s brother’s son. I made contact and he verified that he was indeed Mae’s nephew. He basically told me the story of the family and all the pieces of her early life fit together. Sadly, this nephew died about six months after we spoke. He was the closest member of her family left who knew the story. Lottie: What about her son, Koran? Didn’t he know the story? Michael: Koran, or Daniel Cunning, as he is known today, knew nothing about his mother’s early life. Mae never told him the circumstances around her own birth. When I told Daniel about a first cousin, he had no idea he had one. Lottie: So, in addition to silent film buffs, Mae’s son will also learn a lot from your book? Michael: I think he will. Mae all but divorced herself from her immediate family when she was a teenager. So don’t believe claims that she had a fairy tale upbringing. Lottie: The early publicity says that Mae’s son has never spoken to the press. How did you score the interview with him? Michael: By his own admission, he has not spoken to the press. He has a dislike for the press that stems back to the early 1940s when he was thrust into the middle of the spotlight as a teenager. After living with a family who cared for him (following a double mastoid operation), Mae decided she wanted her son back. She fought the Cunning family and Koran’s father, David Mdivani, in court for several years. Lottie: Why did he talk with you? Michael: I believe I sent him a letter, which he didn’t answer. I then made contact with his daughter, Cee Cee, who helped me make contact with her father. I think Daniel came to realize that I wanted to write a biography about his mother that told the truth. It would not be a hatchet job, but it would also not be a whitewash. 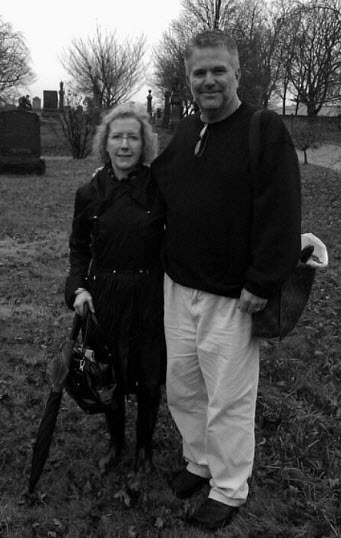 The cold, rainy day that Mae’s granddaughter, Cee Cee, and I went looking for Mae’s relatives in a local cemetery. Lottie: Given the research you’ve done, when and where was Mae Murray born and what type of childhood did she really have? Michael: Next question. All that is in the book. Mae and her first husband married in 1908. He didn’t make it to her selective memory. 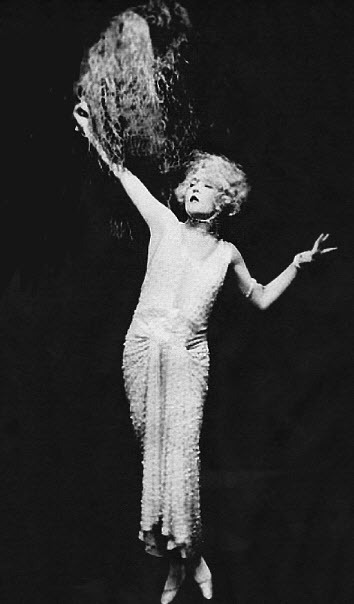 Lottie: How does The Self-Enchanted, Mae’s biography, compare with your book, Mae Murray: The Girl with the Bee-Stung Lips? Michael: I’m glad you said biography. Many people make the mistake of saying that The Self-Enchanted was an autobiography. It wasn’t. Jane Ardmore worked with Mae over a year in the late 1950s to bring her life into print. Ardmore did the best she could with a subject who remembered what she wanted to remember. Mae was terrified of dates, so she never wanted to talk about the Follies of 1908. 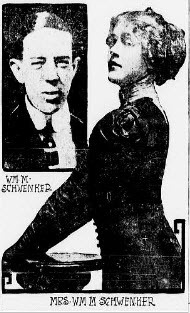 There is also the story where Jane Ardmore asked Mae about her first husband, William Schwenker. “Never heard of him,” she replied. Mae had a very selective memory. Lottie: She’s also been written off as a flake, not much of an actress. Michael: Nothing could be further from the truth. I hope my book will encourage film buffs to view the films of Murray’s that are widely available. I’m not only thinking about The Merry Widow, which was certainly her finest performance, but others, such as A Mormon Maid and The Delicious Little Devil. A Mormon Maid is very much a drama and she carries the role of Dora brilliantly. The Delicious Little Devilgives Mae a chance at comedy, and she runs with it! She’s delightful in it. Her talkies, I admit, are rather hard to watch. Here was a women pushing fifty and still wanting to play 20-year-old ingenues on the screen. She is over the top in Bachelor Apartment. 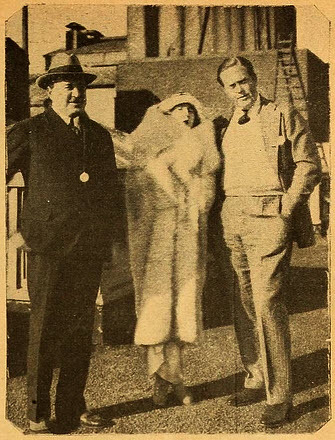 Mae and Bob Leonard (R) meet with writer Vicente Blasco Ibáñez on the roof of the St. Francis Hotel in San Francisco. 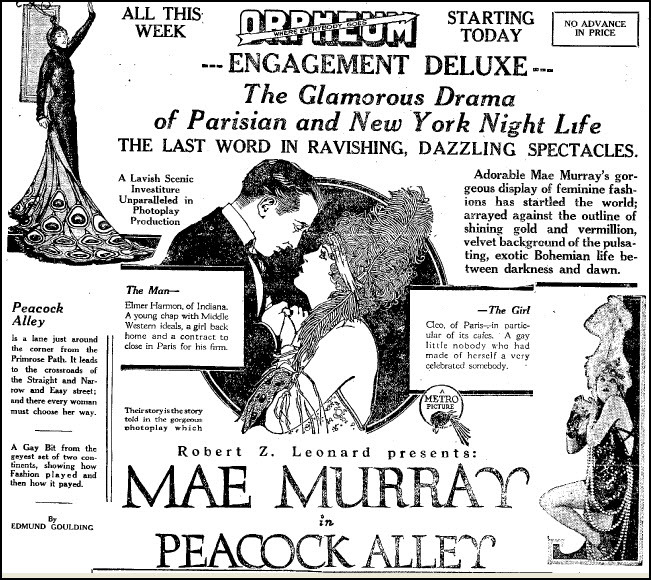 The writer penned a screenplay for one of Mae’s films. 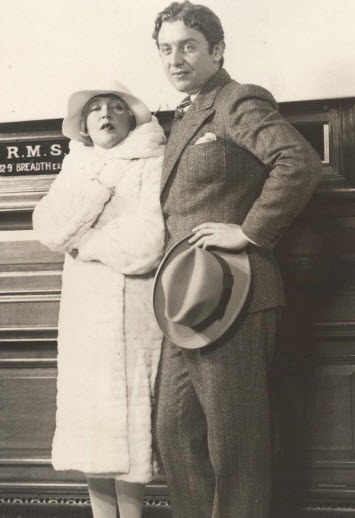 Lottie: Were her alleged fights with director Erich von Stroheim on the set of The Merry Widow for the sake of publicity? Michael: They were not fights, they were battles. It was a very stressful and tumultuous set for most of the production. 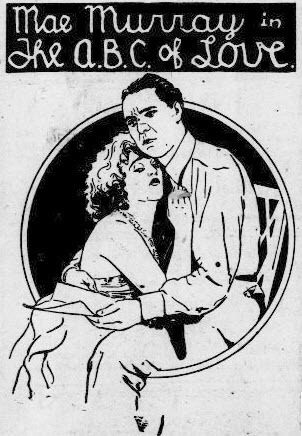 To his credit, von Stroheim was able to tame Mae in a way that he pulled from her the best performance of her career. At least from the films we can see and use to judge her work. It is unfortunate that they never gave each other the credit they deserved, but Mae was one who could hold a grudge. There is a radio interview with Mae in 1960 that I was able to transcribe for the book. Even at that late date, she was still boasting about “that man” and how she fought him tooth and nail. 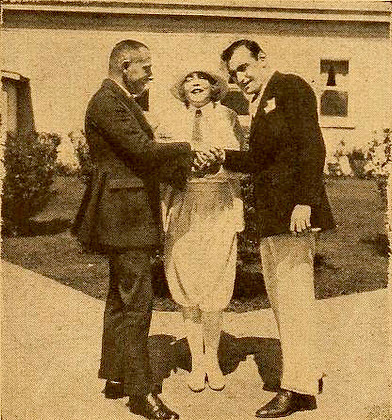 Mae with Erich von Stroheim (L) and Benjamin Glazer. 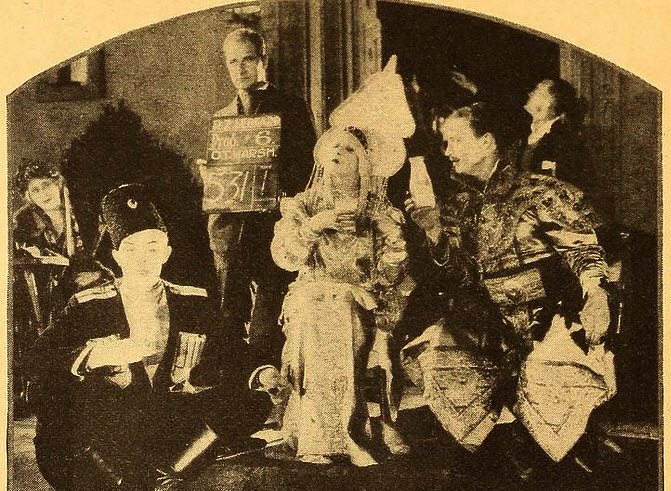 shortly before the filming of The Merry Widow began. Take a close look. They are smiling. Not for long! 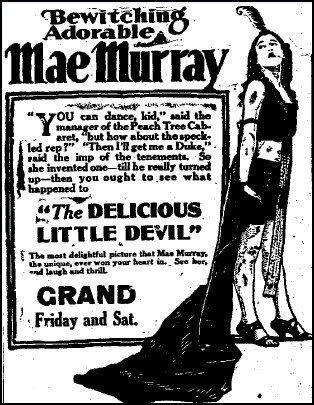 Lottie: What impresses you about Mae Murray? Michael: It has to be the commitment she had for her work. 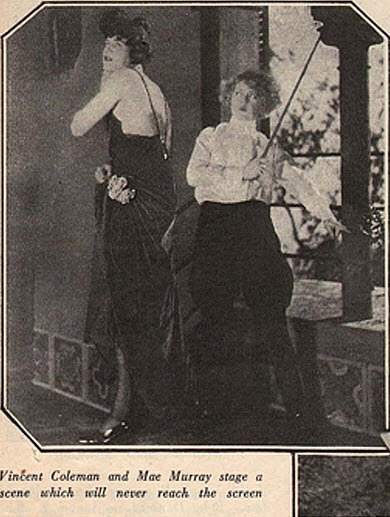 No one worked harder at being a star than Mae Murray. I’m not only talking about her work in front of the camera. While she was married to Robert Z. Leonard, she had her hands in everything. She produced some of her films; she wrote some of the scenarios; she would travel to New York to personally select gowns, furs, and negligees she would wear in her pictures. With Bob Leonard, she was there helping to sell her early pictures for Tiffany to distributors. She would confront critics if she didn’t like a review and she would blast any talk of censorship. There are many examples of her dedication to her work in the book. She was very serious about her profession. 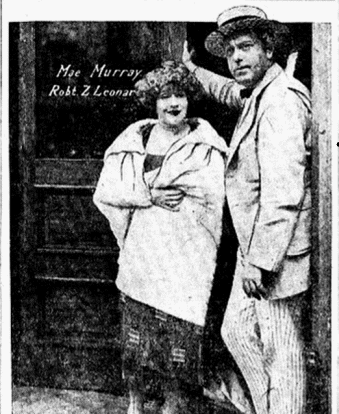 Mae and Bob Leonard outside the Manhattan studio (1921). Lottie: She was called temperamental. Michael: And she was! She could be impossible at times. When asked about it, she would insist that she was simply protecting what had been given to her: the chance to bring joy and entertainment to her fans. Mae and other major stars did a cameo in Married Flirts. 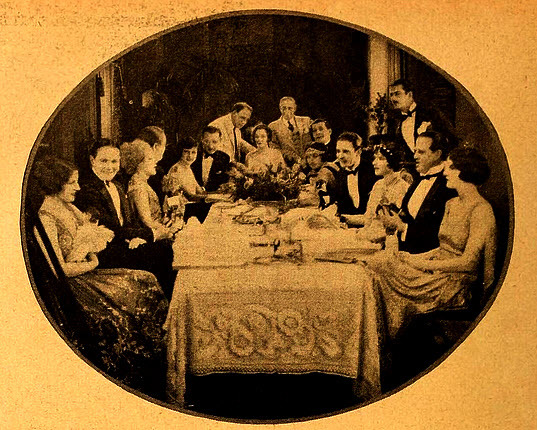 (L-R), Norma Shearer, William Haines, Mae, Bob Leonard, May McAvoy, Conrad Nagel, Robert G. Vignola, Pauline Frederick, Harry Rapf, Hobart Henley, Mae Busch, John Gilbert, Mario Carillo, Aileen Pringle, Paul Nicholson, and Patterson Dial. Lottie: What disappoints you about Mae Murray? Michael: It would have to be the way she treated her family, especially her son, Koran. Without going into too much detail, because it’s thoroughly documented in the book, she withheld valuable information that every human being has the right to know. Mae went to her grave without ever telling her son when he was born or the circumstances around his birth. It’s one thing to keep those details from the press, but it’s another when the information directly impacts someone you bring into the world. Knowing those details gives us context and a solid footing into our place in the human race. To have withheld that information, in my opinion, bordered on cruelty. Lottie: Her son’s birth created a lot of buzz around Hollywood. What’s the real story? Lottie: If you could invite Mae to cocktails and spend some time with her, what would you ask her? Michael: Those things she refused to discuss. I would want to know more about her early years. Chances are, however, that I wouldn’t get very far. Lottie: What would Mae think of your book? 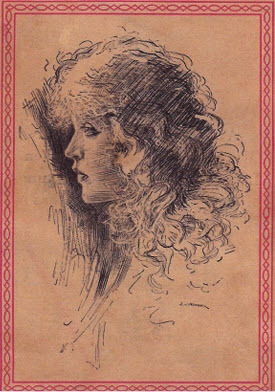 Lottie: Do you think you came close to understanding who Mae Murray was as a person? Michael: That’s a question I didn’t expect, Lottie. 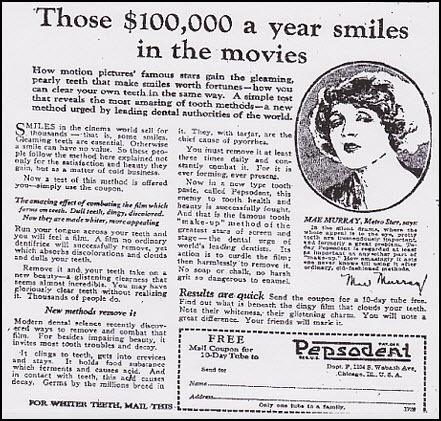 I think I have come close to uncovering the real Mae Murray. Who knows? How does a biographer ever capture something as complicated as the life of another human being. It seems an almost impossible feat. Mae was not all seriousness. She could have some fun. One Sunday afternoon, on the set of Fascination, she and Vincent Coleman (L) switched roles. They filmed the scene. Sadly, it didn’t make it into the final film. Lottie: Having read the proofs of Mae Murray: The Girl with the Bee-Stung Lips, I can say truthfully she had anything but a normal life. 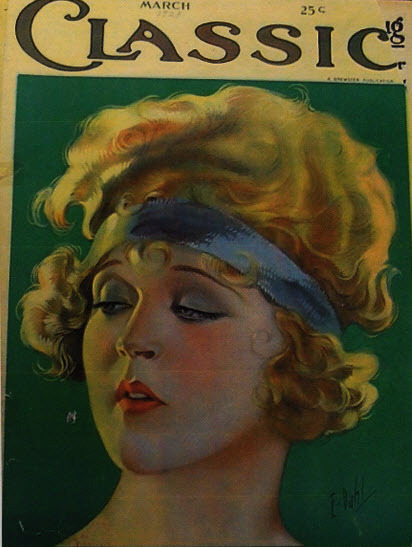 As I sit here working on the index for Mae Murray: The Girl with the Bee-Stung Lips, I learn that the book has been named by The Huffington Post as one of the 10 must-read film books being released this fall. Thanks, Thomas Gladysz and The Huffington Post. Check it out! 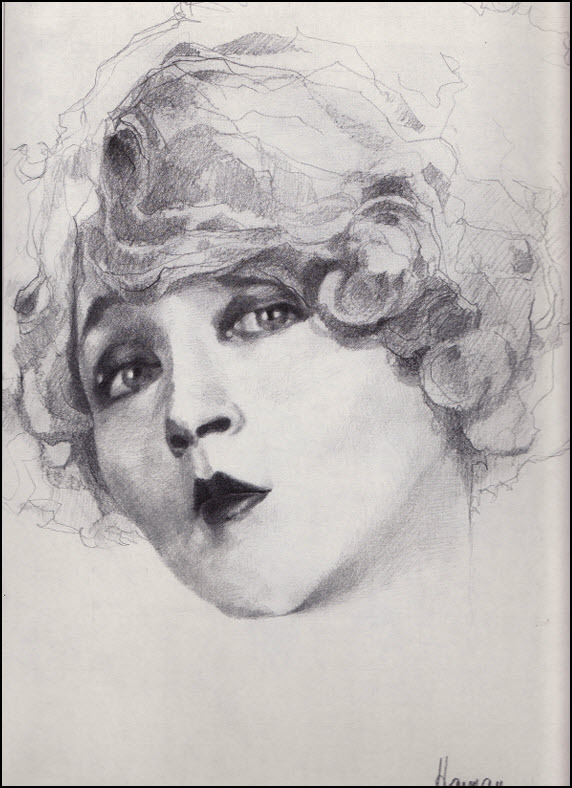 Artists and illustrators over the years have tried to capture the essence and beauty of silent film actress Mae Murray. 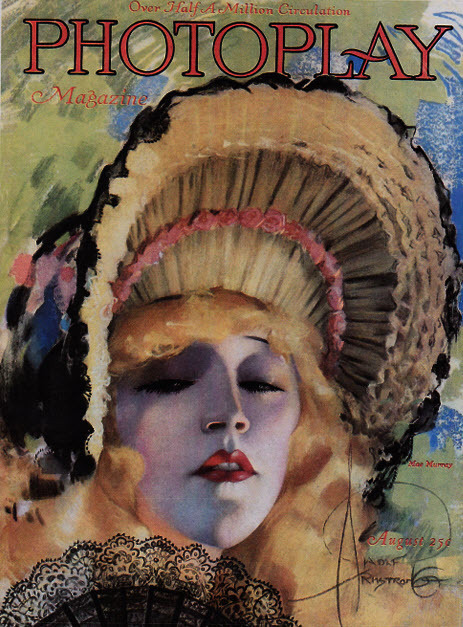 In anticipation of the release of my new book, Mae Murray: The Girl with the Bee-Stung Lips, in the fall, I wanted to share with you some of the best examples of Mae Murray in art. Enjoy! 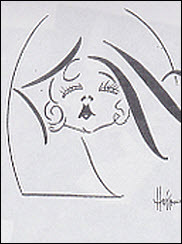 Bob Harman‘s caricature of Mae Murray is one of my all-time favorites. He was truly the Artist of the Stars. As seen through the eyes of artist Nell Brinkley. 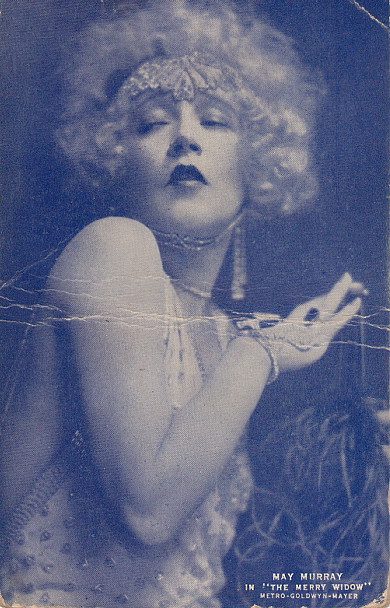 Mae in silhouette in an ad for Sans Souci (mid-1910s). 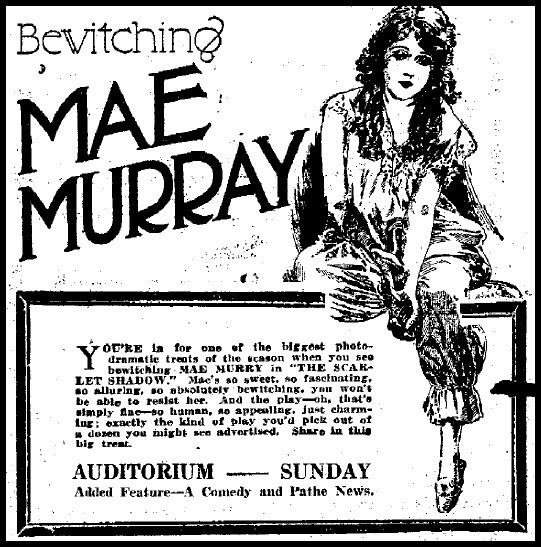 Advertisements for Mae’s films were some of the most interesting depictions of the actress. 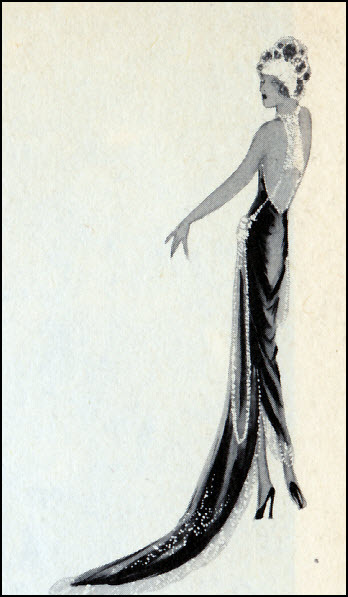 A. L. Ewine’s 1924 drawings of Mae in Mademoiselle Midnight. 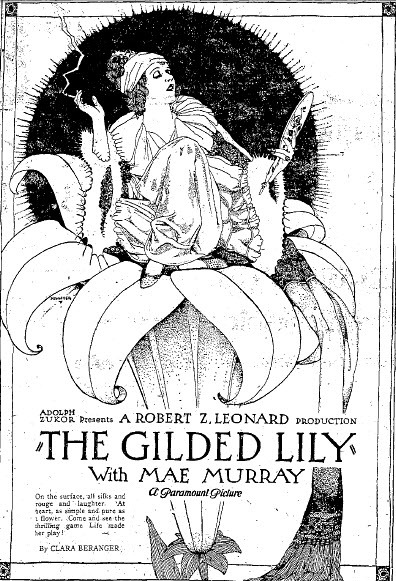 A 1927 sketch for the Los Angeles Times. 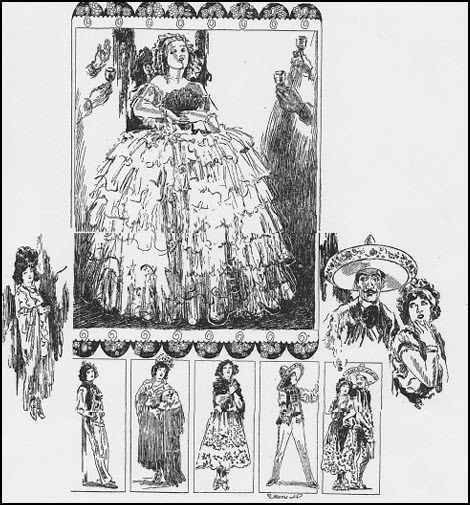 Sketch for one of Mae’s gowns in The Merry Widow. At the height of the Murray-Negri feud (1927). 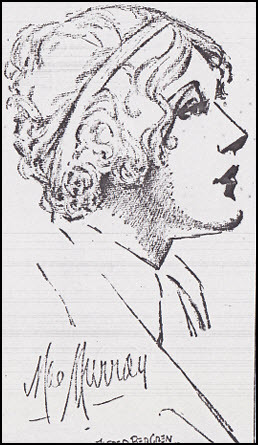 A drawing from a 1941 article relating to Mae’s struggles. 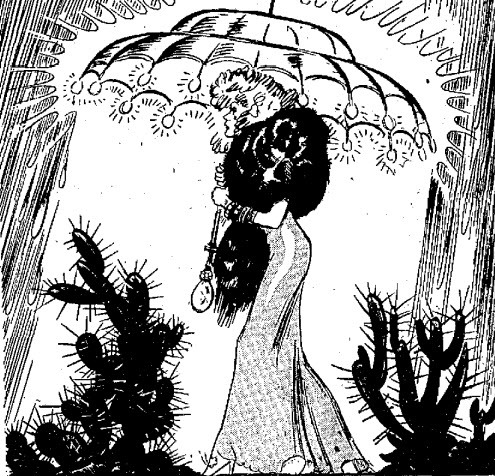 The quote underneath reads, “Throughout all her difficulties Mae’s glamour was like an umbrella protecting her and helping her survive the deluges of woe through the years. An artist envisions Mae sleeping homeless on a park bench in Central Park. 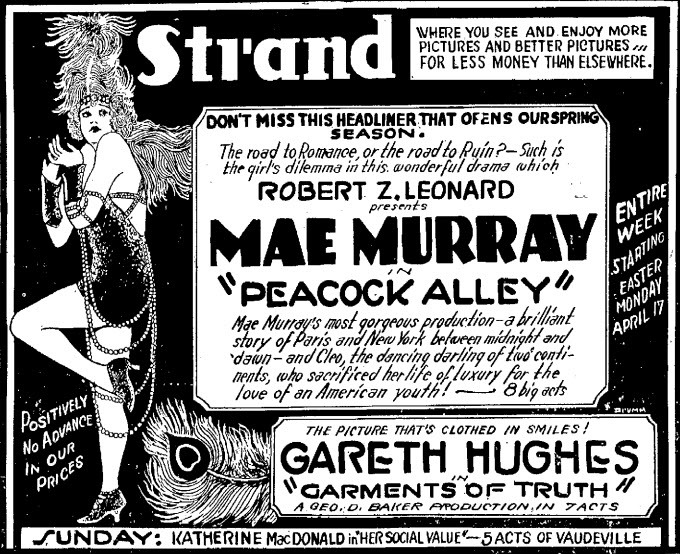 A 1946 illustration that advertised Mae’s lecture series. 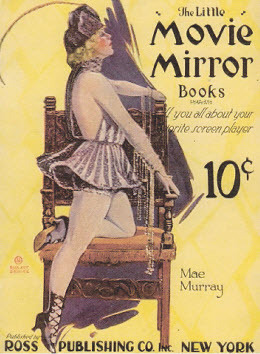 Mae graced the covers of the most popular movie magazines.